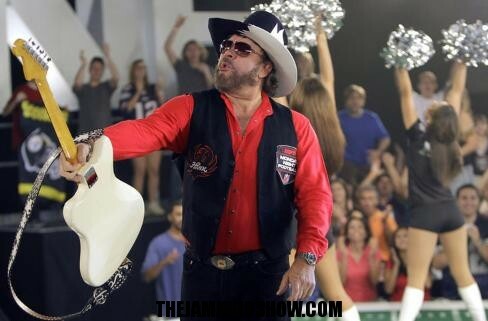 Hank Williams Jr. is about get it even!!. Williams’ has cut a new song “I’ll Keep My …,” calling out “Fox & Friends” and ESPN after an interview last week on the Fox News talk show led to the end of his association with the sports network and “Monday Night Football,” long home to his “Are you ready for some football?” theme. He’s also scheduled to appear on “The View” and “Hannity” on Tuesday to discuss the uproar that sprung up after he made an analogy that President Barack Obama and House Speaker Rep. John Boehner golfing together was like Nazi leader Adolph Hitler and Israeli Prime Minister Benjamin Netanyahu playing a round. ESPN decided to pull Williams’ intro from last Monday’s “MNF” telecast after the comments and the move became permanent Thursday when both sides said they’d decided to pull the spot. Williams wrote the topical third verse of “I’ll Keep My …” when he woke up Friday morning and he and a group of players laid it down in a Nashville studio by Friday afternoon. It could be on iTunes late Monday or early Tuesday. Early in the song, he says the U.S. is “going down the drain” and says it’s becoming “The United Socialist States of America.” He mentions keeping “Fox & Friends” and ESPN out of your home toward the end of the song. Williams’ comments last Monday drew unlikely reactions with many commentators and comedians coming to his defense, claiming ESPN was infringing on his right to free speech. His defenders included the left-leaning Whoopi Goldberg and Joy Behar of “The View” and Jon Stewart of “The Daily Show” and on the other side of the political landscape Sarah Palin and Rush Limbaugh. The brouhaha prompted Williams also to start selling “Hank Jr. for President” T-shirts on his website. Williams’ theme song has been part of “MNF” since 1989. The song was a version of his hit “All My Rowdy Friends Are Coming Over Tonight” that he altered to match each week’s game. He owns the song and all the rights to it, so ESPN will not be able to use it in any way. Instead, the network says it will use an intro featuring Hall of Fame running back Barry Sanders and soul singer Jimmy Scott prior to the Chicago Bears at Detroit Lions game Monday night. The introduction will change each week.